The site is between the 4th and 7th intercostal spaces, between the mid-axillary and anterior axillary lines. Aseptic technique, infiltrate skin and subcutaneous tissues with local anaesthetic. Incise chest wall 2 cm below proposed site of insertion. Perform blunt dissection using artery forceps through to the pleural cavity. Connect the drain to an underwater seal device. Perform a purse-string suture around the puncture site to aid sealing after removal. 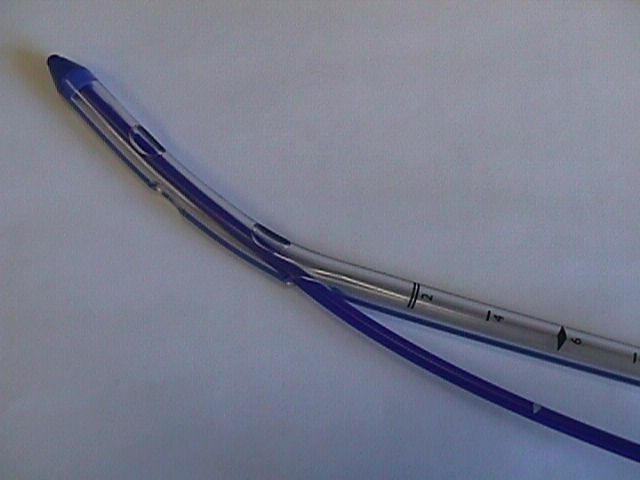 *Some chest drains come with a flexible trocar, thus avoiding risk of trauma. The effective drainage of air, blood or fluids from the pleural space requires an airtight system to maintain subatmospheric intrapleural pressure. This allows re-expansion of the lung and restores haemodynamic stability by minimising mediastinal shift. The basic requirements are a suitable chest drain with minimal resistance, an underwater seal and a collection chamber. The drainage tube is submerged to a depth of 1-2 cm in a collection chamber of approximately 20 cm diameter. This ensures minimum resistance to drainage of air and maintains the underwater seal even in the face of a large inspiratory effort. The chamber should be 100 cm below the chest as subatmospheric pressures up to -80 cmH2O may be produced during obstructed inspiration. Drainage can be allowed to occur under gravity, or suction may be applied. 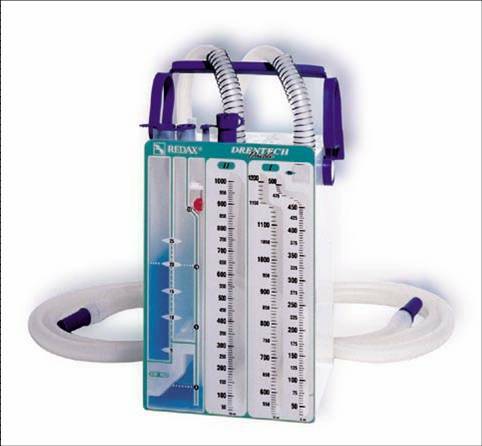 Mulitfunction chest drainage systems (Redax) have been designed primarily for post-cardiothoracic surgery and chest trauma management. Multichamber bottles are provided, incorporating both functional and safety features. They combine patient protection with effective drainage, accurate fluid loss measurement and clear detection of air leaks. The multifunction systems allow single or multi-catheter drainage and are suitable for both gravity and suction-assisted drainage. The unit has a latex-free patient tube and a filtered water seal to prevent contamination. Three- and four-chamber units are also available, which provide two independent collection chambers, an automatic positive pressure relief vent and a filtered negative pressure valve.